Living in Paris for over a month has sufficiently allowed me enough time to a) know where to get the cheapest happy hour, b) avoid certain hours on the metro for fear of being a sardine during rush hour, and c) come up with a good summation of thoughts on Parisiens. I cannot wait to share with you. The first thing I have to say about Paris is it is NOT a myth that everyone smokes. My friends and I frequently discuss this topic, especially when walking around near a high school seeing 13 or 14 year olds outside on their breaks chain-smoking in groups of 10 or 20. Or sitting at cafes we have certainly commented on the fact that we do not believe smoking should be legal when an adolescent is still wearing braces… Many times in my life if someone asked me if I smoke, I would be offended. But here, it’s the opposite. You should most often assume that whomever you’re talking to does smoke, it’s just safer that way. I’m one of those people who are obsessed with babies. I would be a baby snatcher if I could. Especially well-dressed French-speaking babies. Every day when I walk down the street (I live right next to a school), I smile at all the little children dressed in their pea coats walking hand in hand with a grandparent or in a stroller. Then I forget where I am and that I cannot be smiling at a stranger, let alone a child, ever. It’s not normally something you would think about – someone holds the door open for you, you smile and say thank you. But in Paris, no no no. Smiling at strangers is a serious faux-pas. On the metro, there is no smiling, no talking, no looking, for that matter. If you make eye contact with the person sitting across from you, thou shalt look away as fast as humanly possible. And if a stranger next to you sneezes, do not say bless you. It just embarrasses them. After Madame got back from the Edward Hopper exhibit the other day, we were going through the exhibition program over a cup of tea and discussing how the American painter differed from many French artists. His representation of American life made me think about the differences I had noticed between these two cultures. While in the American artist’s painting there is normally a figure or two sitting together in a space, they will not be interacting with each other. This reminds me about the fakeness of Americans and while I would generalize and say that we are friendly people, sometimes I associate that friendliness with a fakeness that only Americans truly understand. We could be “BFF” with someone in half a second, but whether that relationship continues and contains any real substance, that hardly ever comes from an instantaneous connection. The French are withheld and individualistic – and that I love and hate about them. Relationships are hard to form, but once they are there, they are much deeper. 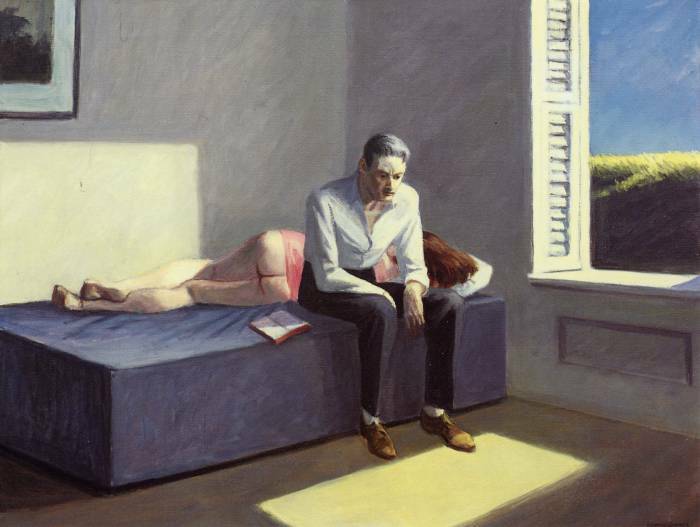 Here is a Hopper painting that I found particularly interesting. Most of his subjects look similar. A lot of focus on simplicity, the color, and light. With one or two subjects but without interaction. His commentary on what it is like to have an American life is definitely not what I would have originally thought of, but now that I have looked more at his work, I definitely agree with his somewhat negative commentary. There’s a million and one things I could say about the Parisiens, but I shall refrain. They are a very particular people to love, but I do love them. I love that they love to hate everything. It’s their passion for everything they do that resonates with me. Their love of food (and not eating it), smoking, their language, themselves, it’s all just too fabulous not to enjoy. I’m ignoring the fact that I have 2 months left here, because in my mind, I’ll be here forever. I’m so glad that you embrace every aspect of this experience…It is just wonderful to hear you views and your enthusiasiasm is palapable….Continue to enjoy each moment!! Encore. Votre contes sont super et j’aime beaucoup le idea que quelquon avoir l’amour et etre contra avec les choses francaise.a la meme temp.